X-Link Universal Remote Control is a six device universal remote with built-in support for both Xbox and infrared for home audio visual equipment. X-Link comes pre-programmed to support numerous models of TVs, VCRs, DVDs, DVRs, surround sound systems, cable, satellite and set top boxes. 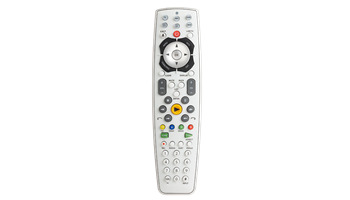 In addition to the pre-programmed codes, X-Link can learn infrared commands from other remote controls. Overall Dimensions: 7.5" x 2" x 1.06"